I was jolted awake when the bus made a sudden turn. I looked out the window and was dismayed to see that it was raining. The rain was unrelenting, following us for hours as we journeyed from Meknes to Chefchaouen. It was nearly four o’clock when we glimpsed a sea of blue on the side of the mountain. 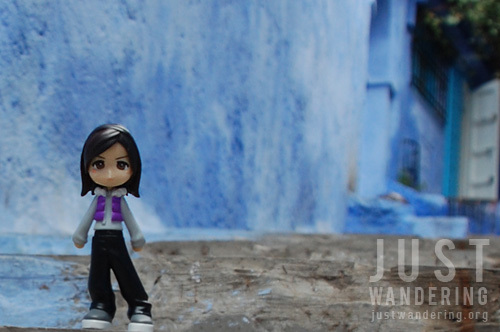 So Chefchaouen really was blue. The rain still hasn’t let up when the bus pulled into the town’s central bus terminal. We dashed through the puddles and up the steps to the station’s offices to book our bus going down to Fes in a couple of days. We were hoping that the rain would have already stopped when we were done with our business, but it still continued to pour. Luckily, when we went down to the waiting area, a taxi drove in to drop a passenger. We asked the driver if he can take us to Pension Suika, and after some (half-hearted) haggling, we agreed on a price. He drove off and soon we are encountering seriously sloped roads. We never seemed to stop climbing, and soon enough, the driver stopped, and in our addled state, it seems he stopped in the middle of nowhere. We stood around looking lost when a man approached us, asking “Pension Suika?” Since we couldn’t make any sense of the directions the hostel gave us, we gladly went with him. We walked in the pouring rain, through cobbled streets and down a series of steps. I’ve never been more glad to arrive in a hostel. Unfortunately, the good Samaritan wasn’t so good after all; he badgered Cla for money for “guiding” us, until the hostel’s receptionist chased him out. As we were checking in, he gave us some bad news: the rain seeped in and the room we reserved was wet. Don’t worry, he said, he got us rooms at the hostel next door. We can just check in to Pension Suika the following day. We were herded to Hotel Mauritania and up even more (uneven) steps. The room was… well, it wasn’t the best, but we were glad to rest and get out of our wet clothes. We both plopped down on our beds and was promptly asleep. It was dark when we woke up and our tummies were grumbling — we haven’t had anything to eat since breakfast in Meknes. It really is blue. No color adjustments. The rain has thankfully finally let up and we were able to stay dry. The temperature remains low though, and we opted to sit near the kitchen of the restaurant we picked to avoid the mountain breeze. We were served the customary bread and some olives as appetizers. We gleefully dug in, eager for some nourishment. It was fairly late and it was pretty dark, so after dinner, we just walked back to the hostel. We stopped by the nearby store for some drinks when we spotted packs of Filipinos, chocolate covered biscuits. Cla treated me to a pack and it was a pretty good dessert and snack. The following day, we went back to Pension Suika and finally got our room. It was clean, there was hot water in the shower and there’s wi-fi. Since breakfast isn’t included with our accommodation, we headed back to the square to eat. 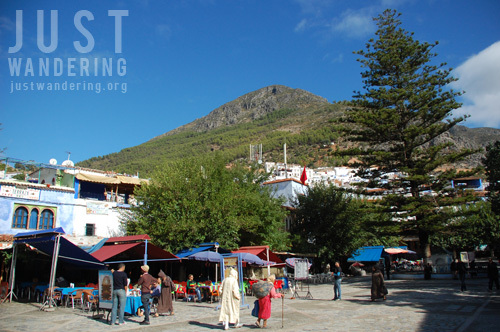 Nature seem to want to make up for the previous day and presented us with gorgeous blue skies that made it a joy to explore Chefchaouen. Being situated on the side of a mountain meant stairs and lots of it. Going around meant having to climb up and down countless steps and inclines. 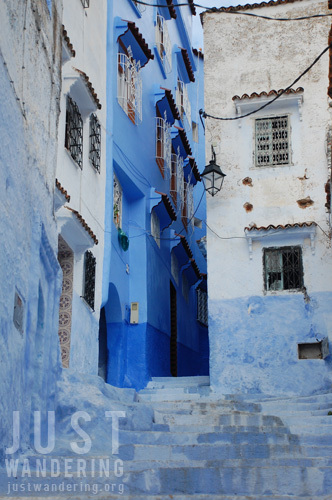 Though it was tiring, getting lost in Chefchaouen’s medina was actually quite enjoyable. 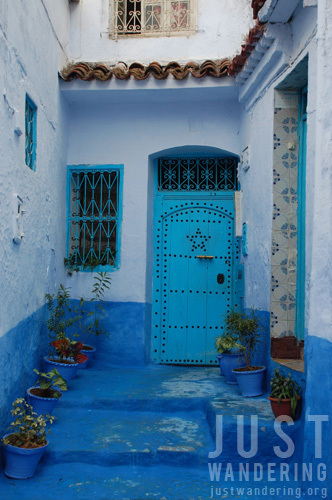 The buildings and houses were painted blue and just begging to be photographed. While researching for the trip, I keep on reading that there are plenty of stray cats in Morocco. We encountered a lot in Meknes, but it was in Chefchaouen that we hit the motherload. There were cats everywhere (specially when we got farther away from the square), and even in our hostel! Chefchaouen surpassed our expectations. We were happy that we found out about it before the trip and was able to add it to the itinerary. Our only regret was that we didn’t stay longer. This is on our IT too… But… The winter breeze is just making us stay indoors most of the time. Haha. I can imagine! Nilalamig na kami dun, autumn palang yun! What more pa kaya ngayong winter! 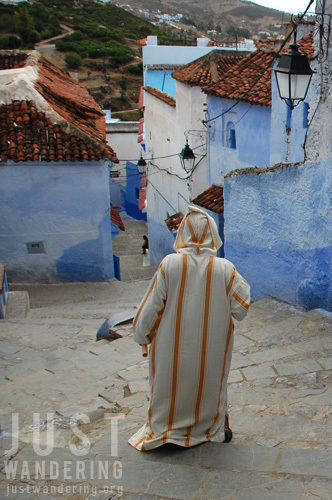 Great post, I love Morocco, I have been there 3 times so far, but have yet to get to Chefchaouen…Definitely next time!